College basketball teams have traditionally enjoyed the best home advantage across sports, but there's been a big drop-off this season. Why? It probably won’t surprise you to hear that I watch a lot of college basketball games. During the last few weeks, I’ve developed a growing sense that home court advantage has not been quite so advantageous. So I reached out to my pals at STATS and asked them to dig into the numbers. I wanted to know how home teams are performing this season as compared to years past. I asked them to limit the sample to conference games only, so we could make an apples-to-apples comparison against past years. So there you have it. The home team is winning at a lower clip this season than at any time in the last 20 years. Not only that, the trend line is quite clear, particularly in the last eight years. I’ve written about this in the past. My theories as to why college hoops has the biggest home court advantage centered on three factors: teams often practice in the same arenas where they play games, which creates familiarities with rims, atmospherics and sight lines; young athletes are more prone to be influenced by unfamiliar environments and hostile crowds; and referees tend to be swayed by the home crowds. So why the drop-off? For an answer, I dialed up Louisville coach Rick Pitino, not just because he is a long-in-the-tooth Hall of Famer, but also because I know that, unlike many of his colleagues, Pitino is a night owl who loves to channel surf and watch games. Pitino also believes those same advances in technology have helped coaches scout opponents much better, which has reduced the impact of variables like game location. Thanks to websites like Synergy, coaches can access reams of information with the click of a mouse. “I used to be able to pick out certain guys that I knew were really prepared, but now because of all the analytics, everyone is good at that,” Pitino said. Pitino did not quite buy my theory that some of this is attributable to the players as well, but here goes: The high school/AAU/prep circuit has become very college-like. That, plus the advent of pop-up “prep” schools featuring small clusters of elite players competing on national schedules, has yielded a generation of players who arrive in college having already experienced big-game environments. They also come with a deep familiarity with other college players since they have all been playing against each other in high school for years. So a young athlete who plays a road game on national television is not as uncomfortable as he might have been 10 years ago. All in all, I think this is a good trend for the sport. We want our games to be decided on merit, not officiating and atmospherics. Either way, the numbers are clear. Winning on the road is still really hard to do. It’s just not quite as difficult as it used to be. • This is a big week for Baylor, which appears poised to take the No. 1 spot in the AP poll for the first time in its history. As you can see below, I did not vote the Bears No. 1 on my own AP ballot because I’ve been voting them consistently out of my top four this season. I don’t look at my ballot as a meritocracy, where a team rises solely because it keeps winning. Rather, I am assessing teams as they stand based on their performance and what I see. And right now, I do not believe Baylor is better than the teams I have ranked above—and frankly, there are some teams ranked below that might be better but aren’t playing as well right now. Having said that, this is clearly a Final Four-caliber team, and as I wrote in an earlier Twitterbag column, I think coach Scott Drew has pulled off one of the greatest rebuilding jobs in the history of college sports. Before Drew took over in 2003, Baylor had been to one NCAA tournament since 1950. In his third season, the NCAA hit the school with a severe penalty, which forced the cancelation of all its nonconference games for a season. In the last nine years, Baylor has been to the NCAA tournament six times and reached three Sweet Sixteens and two Elite Eights. So Drew, his program and his school should do everything they can to savor this remarkable moment. • By the way, out of those three years Baylor didn’t make the tournament, they reached two NIT championship games and won it in 2013. If you think about it—if you really think about it—that tells you more about this coach and this program than anything else. • And yet, Baylor will be an underdog Tuesday night at West Virginia. Talk about a huge game! I love college hoops. • You think Michigan State is going to have pleasant practices this week? I pity those poor players. The Spartans took my coveted Buy-Plus rating I issued in my Hoop Thoughts Stock Report and got embarrassed by Penn State, 72–63, on Saturday at the Palestra. I’m not making excuses, but freshman forward Miles Bridges has only been back for two games (he missed seven because of an ankle injury) and he has scored a total of 10 points on 5-for-13 shooting. He is still a few weeks away from recovering his lottery pick form, but when he does, your investment in this stock will start to pay dividends. You’re just gonna have to tighten your belt in the meantime. • Even so, wasn’t it just awesome that the game was played at the Palestra? • When Arizona beat Colorado, 82–73, on Saturday night, it was the first time all season that the Wildcats allowed an opponent to score 70 points. According to my CBS buddy Jon Rothstein, until that point the Wildcats were the only team in the country that had not allowed an opponent to score 70 points. • Speaking of Arizona, there is still no official change to the status of 6' 5" sophomore swingman Allonzo Trier, but last week Sean Miller did say that he is confident Trier will play at some point this season. That doesn’t reveal much, but it is further than Miller has gone in the recent past. Trier has not played at all this season because of an unspecified eligibility issue. He is allowed to travel to games and he can practice with the team, and from what I am hearing out of Tucson, if and when he does step on the floor, he will be the Wildcats’ best player. Trier was Arizona’s third-leading scorer last season as a freshman (14.8 ppg), but he has worked hard to develop into a well-rounded player. Because he has been practicing all season, the coaches are hopeful that he will be able to resume playing with a minimal amount of rest. The big question is whether he will be back in time for Arizona’s huge game on Jan. 21 at UCLA. 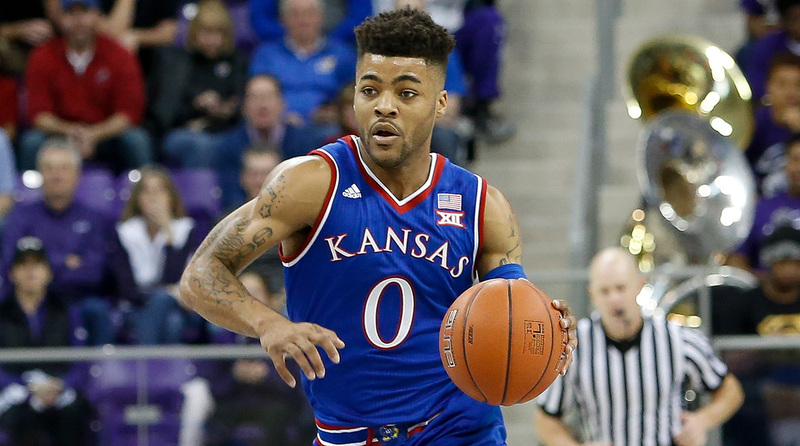 • It’s only a matter of time before Kansas senior guard Frank Mason starts replacing Villanova’s Josh Hart at the top of the national player of the year lists. Check out his stat line in Saturday’s win over Texas Tech: 26 points (11 for 12 free throw shooting), five rebounds, four assists and one steal in 36 minutes. This rotation is down to seven players, and the Jayhawks are frighteningly thin in the frontcourt. Like Hart, Mason is carrying a heavy load, but his supporting cast is not as good as Hart’s. • Incidentally, with that win, Kansas is now 214–9 at Allen Field House under Bill Self. Just making sure you knew. • I suppose I am legally required to comment on the Grayson Allen non-trip against Boston College that went viral Saturday night. No question it didn’t look good, just like there’s no question Allen has brought this kind of scrutiny on himself. But to be fair, whatever he did, it didn’t even rise to the level of a common foul, much less anything flagrant, much less anything that would warrant another suspension. It is possible to be tough but fair at the same time when assessing these situations. • By the way, a Duke spokesman informed me over the weekend that the Blue Devils’ win-loss record while Mike Krzyzewski recovers from back surgery will be applied to his career record, not Jeff Capel’s. That was not the case when Coach K stepped away from the program during the 1994–95 season, when the wins and losses (mostly losses) were applied to interim head coach Pete Gaudet. The reason for the difference is that back then, Krzyzewski did not communicate with his staff and was not involved in game planning. I’m told he will be involved these next few weeks, so the wins and losses will be his. That also applied last year, when he missed Duke’s win at Georgia Tech due to a brief illness. • I referenced in last week’s Twitterbag that coveted wing Hamidou Diallo, who is a postgraduate prep player in New York, was getting ready to select a college and enroll immediately. On Saturday, Diallo announced that he is going to Kentucky. He is technically eligible to play for the Wildcats immediately, but all indications are that he will not. There are three intriguing questions about this moving forward: What if Diallo forces the issue and says he wants to play this season? Will we see more high school players joining colleges this time of year, just as 6' 11" forward Austin Wiley is doing at Auburn? And given that Diallo is eligible for the 2017 NBA draft, will he ever play a game for Kentucky? • Is it me, or did everyone start constantly using the phrase “pocket pass” all of a sudden? • It’s getting harder and harder for big, sturdy but somewhat immobile centers to remain effective in today’s game. Call it the Trickle Down Warriors effect. I’m thinking specifically of Marquette’s 6' 11" Luke Fischer and Purdue’s 7'2" Isaac Haas. Those guys can put up decent numbers at times, but when their teams go up against opponents with smaller, quicker lineups, they basically disappear. Think about it: How often do you see a team that wants to play small adjust its lineup to match up better with a bigger team? It’s almost always the reverse. • Northwestern got a very important piece back last week with the return of 6' 8" sophomore forward Dererk Pardon, who missed eight games with a hand injury. Pardon had 13 points and five rebounds in Sunday’s win at Nebraska. I don’t have to tell you that the Wildcats are looking for their first NCAA tournament bid in school history. If they can stay healthy, I believe they will get it. • I’ve been thinking that we haven’t been talking enough about Seton Hall. The Pirates are 12–3 and have three straight road games coming up at Marquette, Providence and Villanova. Betcha they win two of them. • I often hear announcers incorrectly cite a foul as “over the back.” Remember, you’re allowed to be over the back. You’re not allowed to be on the back. Please make a note of it. • Louisville is 2–2 in its last four games. In the wins, Donovan Mitchell was 9 for 15 from three-point range. In the losses, he was 3 for 16. It’s not hard to see that this is a major X-factor for the Cardinals, but I will say this: If this team is going to be heavily reliant on Mitchell being hot from deep, then its season is going to end earlier than it should. I don’t believe there is such a thing as streaky shooters. Good shooters don’t fall prey to streaks. 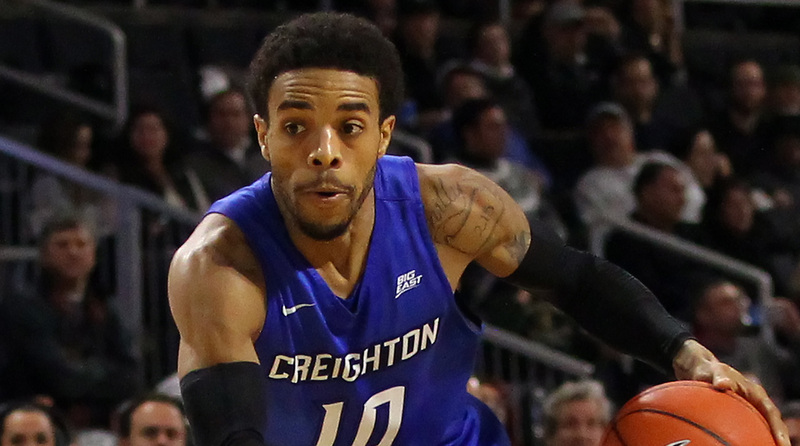 • In Creighton’s win at Providence Saturday, Bluejays point guard Maurice Watson had 14 assists and two turnovers. I just love that little fella. • This is why you never prematurely Sharpie: On Saturday night, Nevada trailed New Mexico by 25 points in the second half and by 14 with 1 minute, 10 seconds to play. From there Nevada made six three-pointers, two of which were banked in, and New Mexico missed six out of 10 free throws to send the game to overtime, where Nevada won, 105–104. The game-winning three came with five seconds left from 6' 7" sophomore swingman Jordan Caroline, who finished with a career-high 45 points. Oh, and it was also the first time Nevada had ever won a game at The Pit. • St. John’s may have come back to Earth last week with losses to Creighton and Xavier, but the Red Storm have the makings of a stellar future backcourt if Chris Mullin can keep them together for a couple of years. Marcus Lovett and Shamorie Ponds, both freshmen, combined for 53 points on just 28 shots in their loss at Xavier on Saturday. If you watch this team play, you can see those guys are going almost purely on instinct right now. Once they learn how to actually play and win, they’re going to be dangerous. • Georgetown really let one slip away at home against Butler on Saturday. The Hoyas led by three points entering the final minute of regulation, but they gave up the lead and got dominated in overtime to drop to 0–4 in the Big East. There is plenty of time to recover and get to the NCAA tournament, but needless to say, the climb is mighty steep. • From Butler’s standpoint, that win was even more impressive than the one over Villanova at home. That’s right, more impressive. It’s easy to be mentally and emotionally prepared to play the No 1-ranked team at home. It’s far more difficult to avoid a letdown and grind out a road win three days later. Butler held the Big East’s co-scoring leader, Rodney Pryor, to zero points in the win. Also, keep your eye on freshman guard Kamar Baldwin, who got promoted to the starting lineup and scored a career-high 16 points. Baldwin also guarded Pryor for much of the game. Kid’s a stud. • I’ve said it often, but I want to be on record: Florida State coach Leonard Hamilton has been a college coach for 29 seasons at three different schools, but this is the best college team he has ever had. • One of these days I’m going to write a think piece (as Lester Bangs would call it) on the meaning of the word “culture.” The poster boy will be Notre Dame junior point guard Matt Farrell, who patiently waited his turn for two seasons behind guys like Jerian Grant and Demetrius Jackson and is capitalizing beautifully on his chance to be a starter. A big reason why the Irish never have a bad season is that coach Mike Brey has used player development and transfers to ensure that his team never gets too young. • With its win over Texas A&M at home on Saturday, South Carolina stayed undefeated while senior star Sindarius Thornwell was in the lineup. During the six games when Thornwell was suspended for violation of athletic department policy, the Gamecocks were 3–3. That is a textbook example of a case where the tournament selection committee will take into account personnel issues. If there was no discernible difference between how South Carolina played with and without Thornwell, then the committee would be less inclined to de-emphasize the losses suffered while he was out. • Looks like Florida guard Canyon Barry might have rediscovered his shooting touch. The 6' 6" senior is a much-ballyhooed graduate transfer from College of Charleston, but his transition to a power conference has come in fits and starts. Barry had a combined 35 points on 12-for-21 shooting in last week’s home wins over Ole Miss and Tennessee. We’ll see whether he can keep it going, but it he can, it will be a huge boost for a team that is very strong defensively but often has trouble scoring. • I don’t know if anyone is keeping official track of this, but from what I see (and I see a lot), I think the refs are doing a much better job this season keeping replay reviews quick. There hasn’t been a whole lot of lingering at the monitors. • I know you’re too smart to be sleeping on Kansas State. The Wildcats, who are 13–2, nearly knocked off Kansas in Allen Field house on Tuesday but lost by two thanks to a travel that wasn’t called on KU’s Svi Mykhailiuk. Kansas State also lost by one point to Maryland in Brooklyn during Thanksgiving week thanks to a late bucket by Terps point guard Melo Trimble. Those two baskets are all that prevented this team from being undefeated. If Bruce Weber’s bunch wants to prove themselves, they can do it by beating Baylor when the Bears visit Manhattan on Saturday. • Not looking good for Oklahoma right now. 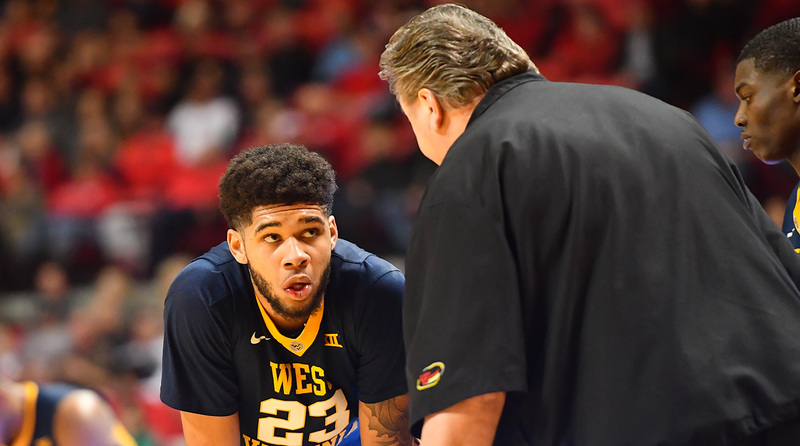 Senior point guard Jordan Woodard, who leads the team in points, steals and assists, has missed the last four games with a leg injury, and there is still no timetable for his return. The Sooners have lost all four games and have now lost six in a row and seven of their last eight. Pretty safe to say they won’t get back to the tournament. • So we have kind of an awkward moment coming up at Syracuse. Jim Boeheim is five wins away from reaching 1,000 for his career—except that the school was forced to vacate 101 of those wins as a result of its latest NCAA infractions case. So while the school is precluded from publicly acknowledging or marketing the achievement, the rest of us are free to decide what to do. • I love it when coaches wear ties that match their school colors. • I can’t say it enough: What Geno Auriemma has done with the UConn women’s basketball is absolutely mind-boggling. We used to think that UCLA’s 88-game win streak under John Wooden was unassailable. Auriemma’s teams have now broken it twice. Their 45-point win over East Carolina last Wednesday was their 89th straight. Unlike the last time, when the Lady Huskies lost two games later to end the streak at 90, this one could reach well beyond triple digits. And this was supposed to be a rebuilding year? • I’d love for men’s college hoops to adopt the FIBA rule that allows for offensive goaltending. It doesn’t happen that often, and it’s an exciting play that encourages players to be athletes. • I’ve also been pining to add fouls drawn to our box scores like FIBA does. That’s well worth tracking, isn’t it? • Very bummed to hear that Ohio State’s 6' 7" junior forward Keita Bates-Diop is out for the season with a leg injury. He was only averaging 9.7 points per game, but Bates-Diop is a naturally gifted scorer and versatile defender. We’ll see whether the Buckeyes will be worthy of an NCAA bid, but they were borderline even when Bates-Diop was healthy. So this is a tough loss. 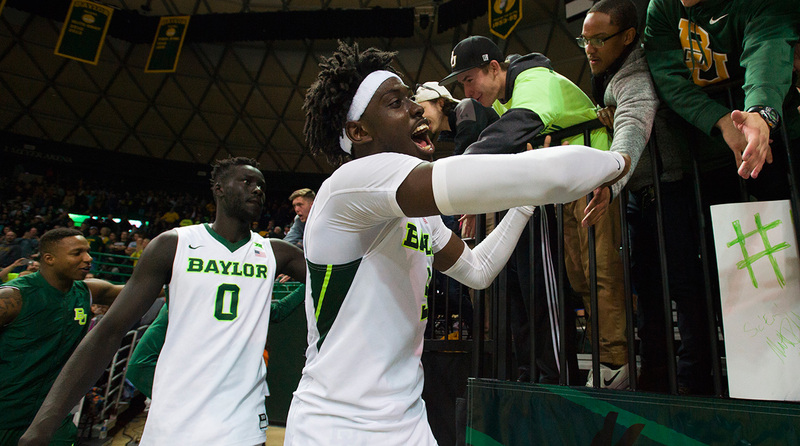 This has been a circle-your-calendar game for weeks now as Baylor has risen in the polls. The Bears’ ability take care of the ball and control tempo (they are 342nd in the U.S. in that category) will be severely tested against the Mountaineers’ vaunted press—not to mention the rabid environment and the heavy mantle of being the No. 1 ranked team in the AP poll. Unless you think Baylor is going to run the table in the Big 12, you have to pick against them in this one. Getting senior guard Myles Davis back will be big for Xavier (he has not played this season because of a misdemeanor charge), but it’s hard to expect him to have a huge impact on the road against a great team out of the gate. Even with senior forward Amile Jefferson in the lineup, it would have been tough for the Blue Devils to go into this pitched environment and beat a talented team. If they have to play without him, it becomes that much more difficult. The Terps have won a lot of games against middling teams, but they played their best of the season on Saturday, when they led the whole way and beat Michigan in Ann Arbor by seven. This team starts three freshmen but is starting to grow up. Is the Big East fun or what? Butler showed its toughness by getting by Georgetown in overtime on Saturday, but it is not easy to go into Omaha and outscore the Bluejays, who are fueled by Maurice Watson, the speedy point guard who leads the nation in assists at 9.1 per game. As I said above, I have nothing against Baylor. I don’t assemble my ballot based on “résumé.” I take into account what teams have done all season long, place a heavy emphasis on how they have performed the last few weeks, and then I step back, assess the big picture, and put them in order of who I think is better. So if you try to make a case that Baylor should be ranked No. 1 because of how many top-25 kenpom.com teams it has beaten, I’m not going to be persuaded. If you want to say that in a seven game series you would put every dollar you own on Baylor to beat any of the teams I have ranked above it (and several that are ranked below, for that matter), then by all means, have at it. All in all, it was a pretty boring weekend. There were no top-25 upsets. You could make a compelling case that Villanova should still be No. 1 despite losing at Butler, but I like the notion of dropping a team from the top spot if it loses. Keeps things interesting. You’ll also notice that West Virginia moved from No. 9 to No. 8 despite its loss by one point in overtime at Texas Tech. I didn’t purposely reward the Mountaineers—they moved up because I felt I needed to drop Wisconsin after their poor performance at Purdue on Sunday. But I didn’t think it was right to punish them for losing such a close game on the road. Purdue’s beat-down of Wisconsin helped Minnesota’s cause since the Golden Gophers had just won at Purdue in overtime last week. They followed that up by winning on Thursday at Northwestern (which proved it is no pushover by winning at Nebraska on Sunday). I’ve seen Minnesota play a couple of games, and they certainly look like a tourney team to me. They’ve got a pair of high-scoring young guards in Nate Mason and Amir Coffey, and they play some mean D.